• Jungle Jim’s – Friday night tasting from 5:00 to 9:00 pm at both locations. Pints are usually $3. This week, they are pouring beers from New Holland at Fairfield. • BC’s Bottle Lodge – Bear Republic Launch Party Saturday at 4:00 pm. Beers include Short Shifter Hoppy Lager, Double Aught Pils, Rogue Red Sour, Racer 5 and The Grizz. • Braxton Brewing – Spotlight Tapping and Can Release at Braxton Brewing Friday at 5:00 pm. • Ei8ht Ball Brewing – Tonight is Free Bacon Night and they will be pouring from partial kegs from the Shelton Brothers Festival in Louisville. Beers include 7venth Sun Yuzu Lager, 7venth Sun Barrel-Aged La Fete, Nogne O Chaga Stout, Pasteur Street Barleywine, Boneyard RPM IPA, and Boneyard Hu Tong Clan. • Listermann Brewing – Barrel Aged Stuff Release Saturday at 10:00 am. Beers available for the release include BA Stuff, Stuff, Stuff Nitro, BA German Cake Aftermath and possibly one or two more. • Urban Artifact – Thoroughbred Variant Bottle Release Saturday at noon. They will be releasing the first 5 of 7 total cocktail variants of Thoroughbred. The bottles will retail for $15.99 plus tax and the 5 variants are: The Deveraux – Lemon zest and elderflowers; Corpse Reviver – Juniper berries, lemon zest, orange zest and grape must; King Cake Old Fashioned – Pecans, walnuts, cinnamon and vanilla beans; Kentucky Mule – Lime and ginger; and Mint Julep – Spearmint and vanilla beans. This week, it’s ten beers from Evil Twin includeing Aun Mas Todo Jesus, Aun Mas Café Jesus, Aun Mas Chili Jesus, Even More Jesus, Imperial Biscotti Break Natale, Molotov Cocktail, Molotov Cocktail Heavy, I Love You With My Stout, Fire Water and Pils al Pastor. Cost varies by beer. Five courses for $55 per person. MENU: First course – RoHoFlo paired with Hominy Hash – Yukon potato + torched rosemary + cumin + paprika + cilantro + sunny side egg; Second course – PSA paired with Fried Brussels Salad – arugula + pickled mango + toasted macadamia + shaved Kenny’s Farmhouse Norwood cheese + lemon zest; Third course – PsycHOPathy paired with Pork Belly – toasted lavender creme fraiche + crispy marble potato + sea salt + pickled red onion + pig demi; Fourth course – Happy Amber paired with Biscuits & Chocolate Gravy – cinnamon + caramel + crispy tarragon; Fifth course: RoHoFlo Cocktail by Josh Miller. Call Maribelle’s for reservations at 513-321-9111. This time, it’s a raspberry wheat. Beers include Nice Melons, Roebling, The Great Miami Hop Project: Episode 1 and Death. This month, it’s their Hopfen Spezial. Moerlein’s new OTR and Third Wave IPA cans will also be available. More information available on Cappy’s web site. Beers include Ojos Negros, Pear Lambic, Triumvirate, Kriek, Ville de Rivere Geuze, Old Sour Cherry Porter, Roebling Nitro, Jeanneke, Lil Sipa, Divergent, Soulless, Nice Melons, Great Miami Hop Project: Episode 1 (Chinook, Black IPA), Sage On Saison, Death and Insurrection. The beers for this week’s Pint Night Thursdays are: Main Strasse Covington – MadTree Rounding Third, Glendale – Urban Artifact Finn and Hyde Park – MadTree Sprye. Moerlein’s new core line up in cans includes Purity Pilsner, Over The Rhine Amber Ale, and Third Wave IPA. Over thirty beers from 15 plus breweries. Your ticket gets you ten 4-ounce pours and “entry for a chance to purchase rare beers such as Three Floyds Zombie Dust, Goose Island Bourbon County Stout, Prairie Pirate Bomb, Founders KBS and others.” Cost is $20 in advance and $25 at the door. From Facebook: “Bottle release day for the first six Funk Series bottles. All bottles are $12.50/each (tax included) with a limit of one bottle of each per person while supplies last. All will be available on draft that day. Also, Funk Series tulip glasses will be available for purchase. Local Beer Competition, featuring MadTree Brewing, Christian Moerlein Brewing, Rhinegeist Brewery, Fifty West Brewing, Ei8ht Ball, Braxton Brewing, Blank Slate Brewing, Mt. Carmel Brewing, Listermann Brewing. West Sixth tap takeover including taproom exclusives like Heller Heaven Double IPA, Second Fiddle Simcoe, Castlewood Black IPA. 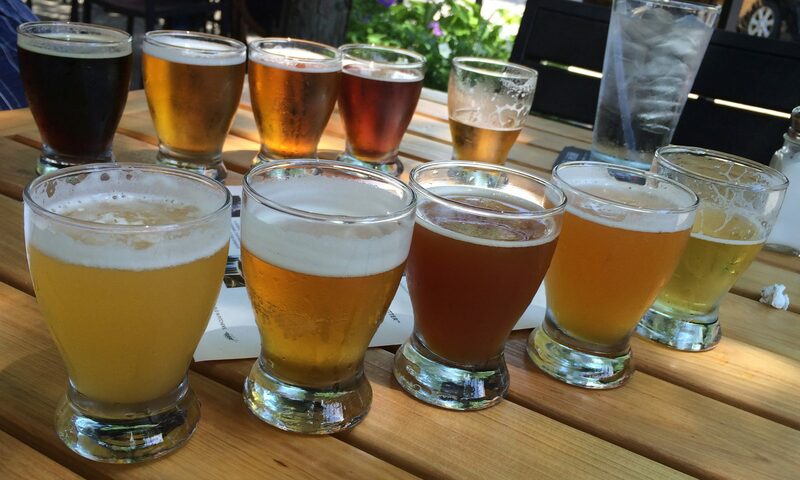 With a minimum donation of $.10, you will get four 5oz samples of their beers. All proceeds will go towards the adoption and medical care for Alex from PawPrints Animal Rescue. At 4:00 pm, they will be tapping the next beer in their Garage Series. Then they will have special Firkins (infusions) tapping at 6:00, 8:00, and 10:00. New Year’s Eve four course dinner menu, with music by a special trio, Todd Hepburn and Yvan Vesserbelt and Chico Converse of Lagniappe. $45 per person or $65 with a bottle of bubbly. Call for reservations 513-861-2484. From their Facebook event page: “Let the countdown to 2016 begin! Join us at the brewery as we celebrate all the good that’s happened this past year and look ahead to 2016! Hit the dance floor with SearchParty – Featuring: Astropat, Druskii, and Voidstar in the Tap Room, or experience something a little different in our Special Event Space with BBG & Company, a Jazz Trio featuring Jake Ball, Philip Tipton, and Brian Batchelor-Gladerin!” Advance tickets are sold out. Day of tickets are $15 and will be available when the doors open at 9:00 pm. Friday, Jan. 1st – Happy New Year AND Happy 7th Anniversary to Hoperatives! We will be publishing our annual holiday hours post tomorrow morning. This week, it’s Crooked Stave St. Bretta and Colorado Wild Sage Saison. Both are $10 for a 13 ounce tulip. This is the last Rare Keg Monday for 2015. Six samples from their tap selection & Jet’s Pizza for $10. Beers include Esther’s Little Secret on draft (last keg in Cincinnati), Abominator on draft, Irreverent Red IPA, Flyin’ Rye IPA and 10 Ton Oatmeal Stout. $3 pints of their Tall Stacks Ale all day.